The diplomatic breakthrough on the Korean Peninsula is taking away one source of geopolitical risk for oil markets, at least for now, with prices dipping in early trading on Friday. Libya oil exports resume at Es Sider. After a brief outage, Libya’s Es Sider export terminal resumed shipments. A pipeline suffered damage from an explosion last Saturday, leading to a temporary outage of 80,000 bpd, but the pipeline has since been repaired. Separately, Libya’s eastern military leader, Khalifa Haftar, returned to the country after a hiatus in France for medical treatment. His absence fueled speculation about a return to instability, which threatened new oil supply disruptions. China’s refinery maintenance. At least six state-owned and private oil refineries will shut down in May and June for maintenance. 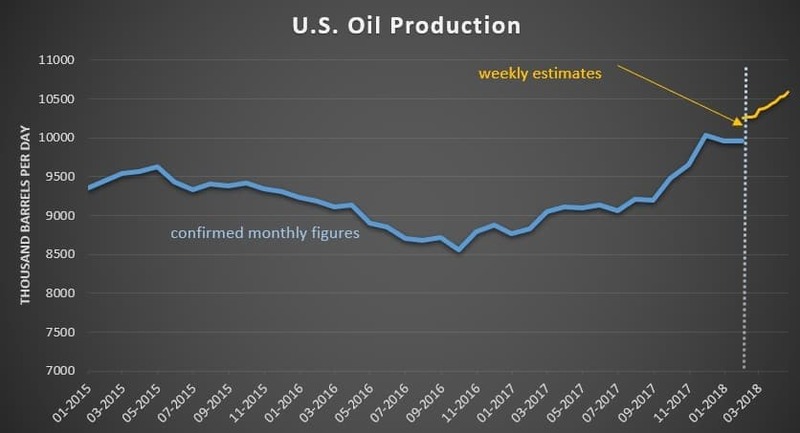 The pause could result in a 10 percent decline in refinery runs, or about 1.09 million barrels per day, which could temporarily hit China’s demand for crude oil imports. Shell greenlights Vito Gulf of Mexico project. Royal Dutch Shell (NYSE: RDS.A) announced the final investment decision for the Vito project, a deep-water offshore development in the Gulf of Mexico. The Anglo-Dutch oil major said the project has a breakeven price of about $35 per barrel and will produce 100,000 bpd at its peak. The project is expected to begin producing in 2021. Trump squeezed between Big Corn and Big Oil. The Trump administration has repeatedly found itself caught in the fight between the oil refining and the corn ethanol industries, industries that are battling over the renewable fuels standard (RFS) and how much ethanol refiners are required to blend into their fuel mixes. Refiners are demanding changes to the rule that requires 10 percent ethanol, asking for a rollback. The ethanol industry is digging in its heels. 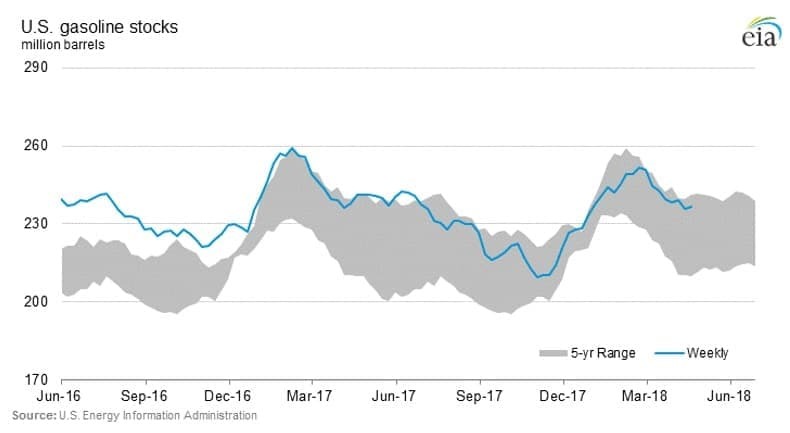 The EPA has granted exemptions to a growing number of refiners, which is giving more urgency to the debate because it is undermining the ethanol market. Trump is caught between the two sides and has tried to avoid making a decision over fears of alienating one of these constituencies. Chevron evacuates staff from Venezuela. Chevron (NYSE: CVX) has come under fire in Venezuela after two of its workers were detained by Venezuelan authorities. That prompted an evacuation of high level company officials from the country this week, raising questions about the longevity of the oil major’s operations there. The matter is of utmost important as Chevron and other joint venture partners have been critical in keeping Venezuela’s oil production from falling faster than it already has. But the attack by the Venezuelan government on Chevron threatens to make a bad situation much worse. PDVSA ordered to pay ConocoPhillips $2 billion. An international arbitration court ruled that Venezuela’s PDVSA must reimburse ConocoPhillips (NYSE: COP) $2 billion related to the early dissolution of their joint venture in 2007. The government of the late Hugo Chavez expropriated Conoco’s oil assets in the country, leading to Conoco’s withdrawal from the country. The arbitration decision would seem to bind PDVSA to paying Conoco, but there is no way to enforce the decision. Conoco had been seeking $22 billion in damages. Japan begins purchasing U.S. LNG. As Dominion Energy’s (NYSE: D) Cove Point LNG export terminal comes online, LNG shipments are beginning to head to Japan, which will be “the first of many,” according to the U.S. Embassy in Tokyo. Macron wraps up U.S. trip, but survival of Iran deal in doubt. French President Emmanuel Macron made an aggressive pitch to President Trump to stick with the Iran deal. Despite the bromance and despite comments about some sort of “new deal” with Iran, Macron admitted to the press that he thinks Trump will still abandon the accord ahead of the May 12 deadline. 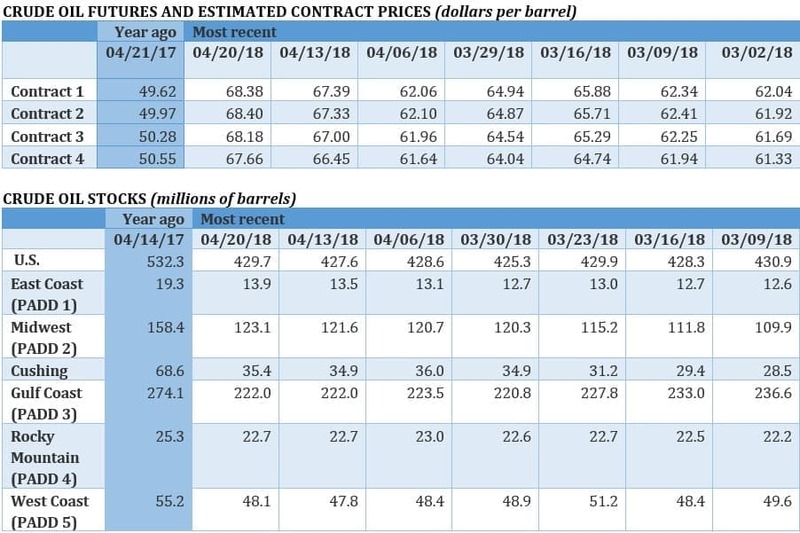 The decision has enormous implications for Iranian oil supply, and thus, the trajectory of oil prices for the rest of this year and beyond. Iran, for its part, said there is no “Plan B” to the existing accord, and that “it’s either all or nothing.” Meanwhile, Bloomberg reports that some oil traders are already steering clear of Iranian oil contracts valid after May 12. 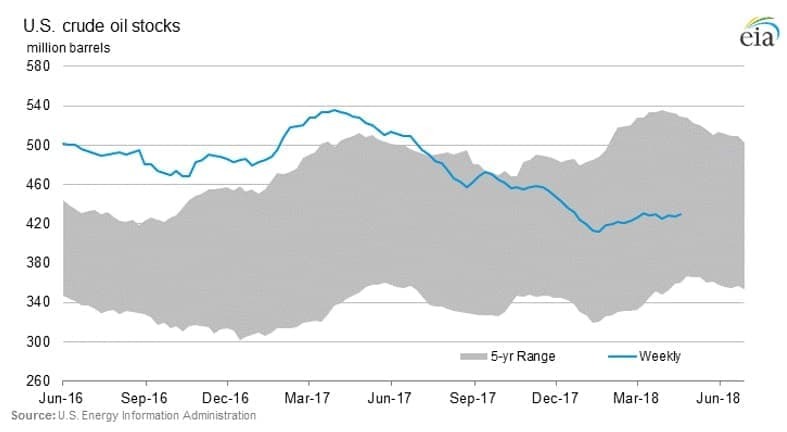 Estimates from FGE and Gunvor SA say that 500,000 bpd of Iranian oil could be at risk this year because of U.S. sanctions. Yemeni attacks on Saudi oil assets increasing. In response to the heavy bombardment from Saudi air strikes, Yemeni rebels have stepped up missile attacks on Saudi oil assets, although without much success to date. On Monday, Houthi rebels fired missiles at a Saudi oil port near the Yemen border. The missiles were intercepted, but the increased attacks raise the prospect of some sort of damage to Saudi oil infrastructure. For now, this is having no effect on supply, but a successful attack would add a significant risk premium to oil prices. “Yemen is one part of the resurgent fear factor in the market,” said Helima Croft, head of global commodity strategy for RBC Capital Markets, according to the WSJ. Canadian oil producers could get some relief from rail. Canadian oil producers, slammed by the lack of pipeline capacity, could make concessions to the rail industry to gain more access to Canadian railways. Rail companies typically demand long-term contracts, a practice oil producers find too restrictive. But, because the pipeline problem has grown more acute without any prospect of relief in the short run, producers are warming up to the idea of moving more oil by rail. Deals signed this year could have a longer duration than previous agreements and they could contain obligations for oil companies to pay for rail capacity even if it goes unused, according to Cenovus Energy (NYSE: CVE). “I’m really confident that as we move into the second half of the year and into the first half of 2019, we’re going to be seeing very material volumes of oil moving by rail,” Alex Pourbaix, CEO of Cenovus Energy, said on a call with analysts Wednesday. Still, whether President Trump stays in the Iran deal or walks away from it is irrelevant to the global oil market or prices. The global oil market has had enough time to factor in the probability of US withdrawal from the deal. A re-introduction of sanctions on Iran will neither impact on the global oil market nor on oil prices. 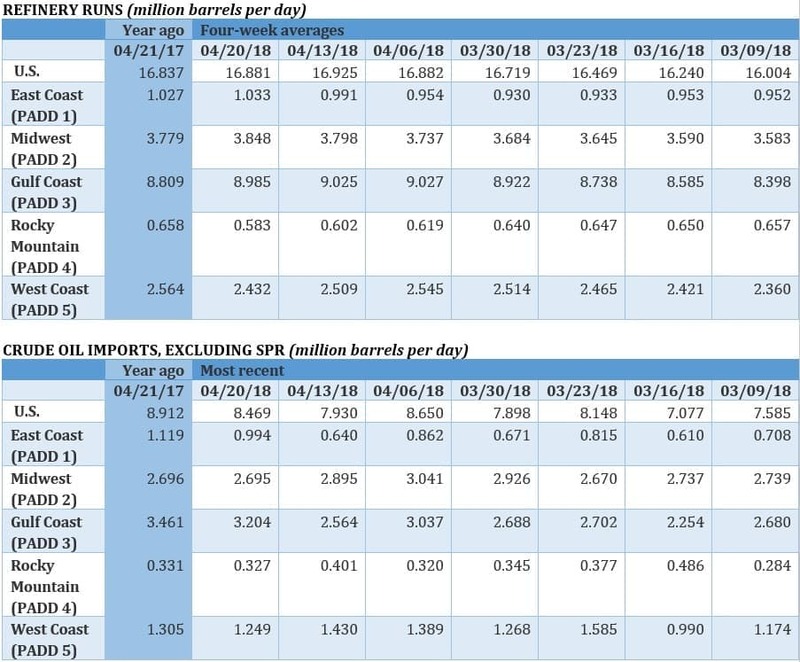 And contrary to what many analysts are predicting, Iran’s oil exports will not lose a single barrel of oil as a result of the forthcoming sanctions. Moreover, Iran will be pricing its oil exports and be paid for its exports by the petro-yuan thus bypassing the petrodollar and also nullifying US sanctions. The pre-Iran nuclear deal’s sanctions were effective against Iran’s oil exports because of a combination of the European Union's (EU) sanctions on global insurance companies insuring Iranian oil cargoes and US sanctions on banking making it difficult for Iran to receive payments for its oil imports in petrodollar. The EU is not going to walk away from the Iran nuclear deal and therefore it will not be imposing any sanctions on Iran thus further weakening US sanctions and Iran will be using the petro-yuan and the euro for its oil sales thus bypassing the petrodollar altogether. As for Yemen, there is a growing geopolitical concern that Yemeni rebels’ missile attacks might sink a Saudi oil tanker near Bab el-Mandeb Strait or damage a Saudi oil production installation. Were this to happen, oil prices could add some $4-$5 to a barrel of oil. Saudi Arabia is well advised to seek a peaceful settlement for the Yemeni conflict which is inflicting great misery on the Yemeni people, costing the Saudi budget an estimated $76 bn a year and posing a growing threat to Saudi oil installations.